Driftwood hearts are random pieces of tree branches that happen to form the shape of a heart. Add some string, and you have a creative piece of art or a gift for a loved one. Here are some driftwood hearts that you can make yourself, or buy them on Etsy! Try to find creative ways to display everyday items in unusual ways along the windowsills of your home. Here are dozens of other ideas for creating fun window art inside your home. 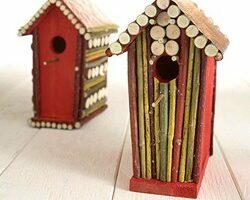 I Found Some Uncommon Goods For Log Home Owners! While searching for unique items made from twigs, sticks and branches, I found the best selection and most unique items at a store called Uncommon Goods. 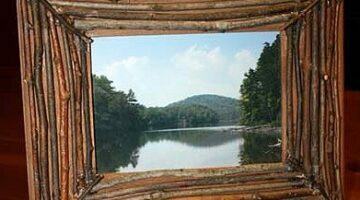 Things made from sticks will add a touch of ‘rustic’ to an otherwise modern log home. 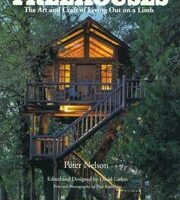 Following are the best books with complete instructions for building a treehouse for your kids — or maybe an escape hideaway for yourself. If you’re still building your new log home, then this might be the perfect thing to do with some of those extra logs, stain and roofing materials!